Amongst all the social and economic developments around us, the last few years have seen a significant improvement for the people with certain disabilities. With more and more public and private spaces being designed appropriately keeping in mind the needs of people with disabilities the addition of mechanical as well as electrical equipment has facilitated their convenience to a phenomenal extent. The most prominent and important development has been in the private transport sector for the people with special needs. Driving schools for people with disability such as Ability On Wheels, Ahmedabad, aims to ensure complete assistance in learning how to drive independently. Further, it also offers wheelchair accessible vehicles via cab service in Ahmedabad for enhanced comfort of travelling. Vehicular modification is one of the most important aspects of acquiring a driving license for people with disability and ensuring safety on road. The modifications which are to be applied to the vehicle are largely specific to the nature of need. Steering modifications – A modified steering is useful in cases where the ability of a firm grip and movement is lost in the upper limbs or the hand. It will allow lucid movement of the steering hence causing least amount of stress on the hand. Hand controls – In case of loss of function in the foot, hand controls are widely used. The vehicle can be equipped with a push/pull lever which will help the user in accelerating and braking the vehicle with hand. A device in the form of a joy stick control can also be employed in such cases for easy movement. Power seats – These aid the user with increased ease in getting into the car and acquiring access to customized stability along with other adaptive equipment. 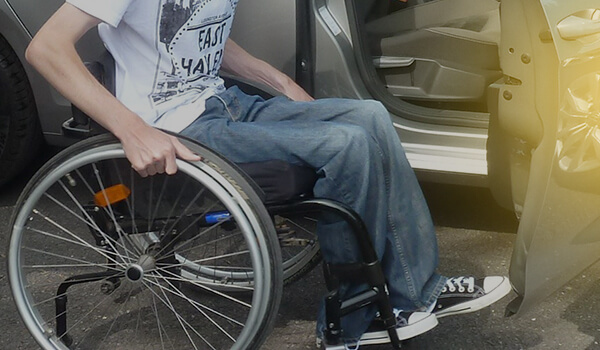 Ramps – These are essential for people using the wheelchair to get into the vehicle. Apart from these, certain other adaptations can be made if needed such as a siren detector for the hearing impaired and an extra grip device for a diminished grip of hands or the feet. In the process of acquiring a license, one is supposed to present the proof of the inclusions of disability specific adaptations in the vehicle which will further ensure their as well as the fellow drivers safety on road. To find a car modification vendor in your city, refer to the link given below.